America's founders provided a remedy for a time such as this - a federal government "drunk with its power" and out of control, with both political parties unwilling and unable to reign in its growth, spending and over-reach into the lives and businesses of the citizenry. As we've seen in recent days, even Republican leaders in Congress are unwilling to challenge the unlawful actions of a tyrannous President, or to even provide expanded Republican majorities in Congress the opportunity to tackle the federal budget and curtail federal growth and activities that have no basis in the Constitution. 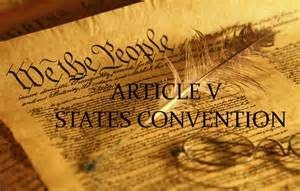 Article V of the Constitution allows for the states to petition for a Convention of the States to consider amendments to the United States Constitution. These amendments must be ratified in the usual way, but the expectation is that the states will reclaim powers lost to a rapacious federal behemoth. South Carolina is one of more than thirty states that are in the process of considering resolutions calling for a Convention of the States. In the following video South Carolina Representative Bill Taylor explains legislation he has pre-filed in the South Carolina House that would lend the state's support to this long-overdue and needed restoration of the American republic.